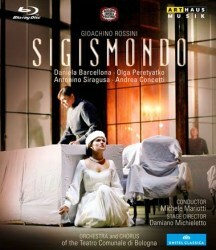 Sigismondo comes in at number 14 in the Rossini oeuvre of thirty-nine operatic titles. It opened the Carnival Season at La Fenice, Venice, on 26 December 1814. Up to the end 1813 had been a ground-breaking year for Rossini. Four of his works reached the stage including the highly successful Tancredi (see DVD review) and L’Italiana in Algeri (see bargain CD with Marilyn Horne). This all served to set him apart from his competitors. The end of 1813 and 1814 were a bit of a let-down for him. His twelfth opera, Aureliano in Palmira had opened the Carnival Season at La Scala on 26 December 1813. It was only modestly received despite the management of La Scala lavishing generous resources on the new opera. Likewise his thirteenth opera, Il Turco in Italia, was also only modestly received there the following August; the Milanese believed they were being short-changed with a cheap version of L’Italiana in Algeri that had been a raging success in Venice the previous year. That said, he had done enough to impress the influential impresario Barbaja who summoned him to Naples and offered him, in his twenty-first year, the Music Directorship of the Royal Theatres of that city, the San Carlo and Fondo and with that post the opportunity to work with a professional orchestra. Sigismondo, like its Milan predecessors was not a success with the Venice audience at its premiere. The opera was taken up by other theatres up until 1827, after which it was not seen until 1992 (Osborne, The Bel Canto Operas, Methuen, 1994, p.44). Needless to say Rossini plundered the score for later operas as well as getting further usage from some earlier ones. This self-plagiarism was common practice in the primo ottocento. Any enthusiast of the composer’s works may readily spot these re-usages and it is an interesting diversion for such cognoscenti to trawl their minds as to the Rossini opera or operas in which they have heard a particular melody before! As I noted in my review of Aureliano in Palmira, taking on a review of an opera one has never heard complete before has its own challenges and requires, at least for me, particular strategies. First, I listen without reading anything of the plot and get a feel of the music, knowing, in this case fairly intimately, the composer’s previous and following works. With a CD, my second hearing involves following through the performance with the libretto, relating the words and the drama to the music. Further hearings are concerned with note-taking on the quality of the singing and conducting as well as confirming any feelings I have come to by that time about the quality and character of the music. With a video recording the challenges differ at this point, with the need to comment on the production and the work of the video producer. This was an occasion, not infrequent in these days of Regietheater and Producer Concepts, that I wished it were just a CD that I could keep re-hearing and did not need to watch. Rossini's Sigismondo is constructed around a tale of guilty insanity, real and imagined, of Sigismondo, King of Poland. Fifteen years before the curtain rises Ladislao, lusting after Aldimira, Sigismondo’s wife, deceived the king into believing she had been unfaithful. The devastated king banished her from his Court to await execution. She escaped and sought refuge in the mountains with Zenovito. Aldimira’s father, King of Bohemia, declares war on Poland and appears in act two, hardly recognisable in this production as royalty. The plot concerns Sigismondo's nightmare hallucinations and the uncovering of Ladislao's machinations and the king’s eventual reconciliation with Aldimira. This production fixes on Sigismondo’s mental state and is set in the ward of an asylum where he is detained; one might have thought that a king would have a private room. Much of the action concerns the non-speaking fellow inmates and their dysfunctional, thankfully silent, behaviour. This does at times distract from what is going on between the principals, particularly in the second act (CHs 31,35 and 36). As well as these extras there are also four silent doppelgangers of the young slender Aldimira, presumably manifestations of Sigismondo’s disturbed state of mind. As to why they appear in the second act, do a partial strip before climbing out through the windows defeats me. Doctor Zenovito and his supposed daughter Egelinda, in fact Aldimira the king’s wife, care for Sigismondo in the asylum. Ignoring the many complications, not to say idiosyncrasies of this staging, I turn to the musical aspects. As the insane king, Daniela Barcellona is quite outstanding in her act one portrayal of a seriously ill mental patient. With singing to match she is, without doubt, the foremost mezzo-soprano in this repertoire with a rich tone, exemplary diction and ability for acted portrayal too rarely seen in opera. As Aldimira, the tall and elegant Olga Peretyatko sings with a warm, centred, expressive and clear lyric tone and with the benefit of a secure top and trill (CH.33). As the only non-Italian in the cast her feeling for words and her ability to colour phrases is notable. She also has the strength of voice to cut through the textures in the ensembles. On appearance alone this Aldimira must have been a child bride. The recitative and duet between her and Sigismondo in act 2 is one of Rossini’s better efforts in this score and, thankfully, is played without the presence of extraneous mute bodies disturbing the drama (CHs.26-28). As Ladislao, Antonino Siragusa’s singing is better in act one than later. To my ears his voice, whilst being capable of the demanding tessitura and coloratura, verges on nasality and, in the second act particularly, touches on dryness (CH.31). Andrea Concetti, doubling as Zenovito in act one and Aldimira’s father in act two, is sonorous and acts well. As Ladislao’s sister Anagilda, who fancies being a royal bride, the young soprano Manuela Bisceglie turns in a promising performance (CH.30), as does the tenor singing the role of Radoski. Very discreet radio mikes aid the overall sound. On the rostrum, the young Michele Mariotti, now chief conductor of the Teatro Communale Bologna Orchestra, does not bring any particular vitality to Rossini’s often turgid score. That, I suggest, is as much the composer’s fault as any. Overall, and despite an imaginative duet between Sigismondo and his wife, the work lacks the vitality of the opera buffa for Rome that were shortly to follow in the form of Il Barbiere and La Cenerentola; likewise, the dramatic inspiration of the seven Naples opera seria he composed between 1815 and 1822. Where a melody is striking and innovative, Rossini plundered it for better use in those later works as with the opening of act two (CH.22) and for which no prize is offered for its identification in its later usage. The eighteen-minute bonus is depressing with various luminaries of the Rossini Opera Festival seeking to justify the director’s approach and staging. It is fair to say, I think, that the attitude manifested is that the ROF will pull in the punters anyway so we can play about to our hearts content. I do not wonder that Philip Gossett, eminent musicologist and scholar, previously in charge of deriving Critical Editions of Rossini’s operas for ROF, got out of as quick as he could with the move to concept production.